Hi friends, how have you been? There’s so much going on in the world right now, and I’ve been wanting to — needing to — write, but my health hasn’t been great. Migraines, then a shoulder injury, then a cold, plus probably some depression, though the symptoms could be migraine symptoms, too. My body’s limitations have been a frustration to me for most of my life, in how they limit my own well being and how they limit the volunteering and activism I so much want to be a part of. I am only working 30hrs a week right now, but that is enough to sap my resources and make it hard to do much else. I made it to a book discussion about Ta-Nehisi Coates’ Between the World and Me, but the other things I wanted to do in January — go to a SURJ (Showing Up for Racial Justice) meeting, go to the Boston Women’s March, go to Logan airport to protest the Muslim ban, go to the protest of the Muslim Ban at Copley Square on Sunday, get back to volunteering at Horizons for Homeless Children, volunteer as a baby cuddler at MGH — were beyond my grasp. Even making donations isn’t feasible for me as I struggle to not only pay the monthly bills but to pay off debt from when I was really sick eight years ago, though I did manage (very) small gifts to TogetherRising for refugee aid, and Black Girl in Maine (paying WOC writers for their work is important) and to contribute to having a sandwich named after a friend of mine who died from suicide ten years ago. I spend a lot of time and energy wishing I had more energy, that my personality was stronger, that leaving the house didn’t make me nervous, that talking to people didn’t exhaust me. But I am trying to do less of that, and focus more on what I *can* do. I can think deeply about things, and I can write (albeit slowly) about them. I can listen well, and hold contrasting ideas in my head without trying to find a facile resolution. I can write (again, slowly) poetry and stories. I can support and cheer for others whose have more energy and extroverted personalities. I can babysit for friends while they go to protests. I watched a wonderful TED talk the other day by Sarah Corbett of the Craftivist Collective entitled Activism Needs Introverts. She had me hooked when she started out the talk by confessing that she used to hide in toilets (British for bathrooms). Here was someone who had dedicated her life to activism, to making the world a better place, and she was an introvert like me! I have hidden in toilets, on stairwells, on sidewalks, and many other nooks and crannies — and that’s when I could bring myself to leave the house. Sarah said that introverts are important to activism because they are good at slow activism, intimate activism, and intriguing activism. Do give it a listen — she speaks to extroverts, too, and she has the most adorable accent. I know not everyone who reads my blog is an introvert, but many of you may have also been wondering what your part is in this strange new world we find ourselves in. In the bible passage I quoted up top, Paul is addressing a controversy in the early church about spiritual gifts. Some of the early Christians were doing extroverted, strong personality kind of things like preaching, prophesying and speaking in tongues, and looking down on other who didn’t have those powerful, charismatic gifts. But, Paul said, there are other kinds of gifts — wisdom, discernment, healing — that are not a flashy but just as important. Paul compares the church to a body, and says that even though different parts of the body have vastly different functions, they all depend on each other for survival. The arms, legs, and head may seem to be the most active and important, but without the quiet beating of the heart, the rhythmic breathing of the lungs, and the kidney and liver working to process toxins, the arms, legs, and head would be lost. We all have a part to play, and no one’s part is less or more important. Frederick Buechner said that, “The place God calls you to is the place where your deep gladness and the world’s deep hunger meet.” What is that place for you? What are you good at? Are you our lungs, breathing oxygen and peace in and the bad air out? Are you our liver and kidneys, processing the toxins of the world to keep us healthy? Are you our brain’s left lobe, thinking clearly and logically, solving problems and cutting through misinformation and sloppy thinking? Or our brain’s right lobe, seeing colors and patterns missed by others, creating metaphors, art, music, and fantasy that speak deeply to reality? Are you our legs, pulling on your boots and getting out there leading us into battle? Or our mouth, speaking truth to power, speaking with courage and kindness? Whatever you are, we need you. We can’t do it without you. Artist? Writer? Creative? Dreamer? Give us space to escape to, help us imagine more beautiful futures. You’re so important right now. Whatever you are good at, it can be of use. Put your skills towards a more beautiful future. Every single one of you has a skill set that we will need. Every single one of you. Find your lane and work it. We need all of us. I need you, You need me, We’re all a part of God’s body. You are important to me, I need you to survive. I’m sitting on my couch writing this, shivering and coughing, covered up in several sweaters and a blanket. I wish I was sitting with the lawyers at the airport. (Those lawyers, man — they are giving me hope.) But I do not have that skill, or that ability. What I do have is my computer. I have my network of friends. I have my blog. And I have prayer, which I still believe in, even now, even more now, even more. Pray for me, and I’ll pray for you. March for me, and I’ll write for you. And one of these days, daggummit, I’ll make it to a protest, too. Maybe a sit in, because standing is tiring. But for now, I write. Love you all. Thank you so much for reading. 1) Go about your day. Be as spacey and scattered as you want, it’s okay. Introverts and artists need days to just wander around doing nothing in particular. If you are not an introvert or an artist, I don’t know what to tell you. I’m not sure what you people do. Go to parties? Accomplish things? Those are not my areas of expertise. 🙂 Whatever it is, do your thing. 2) At the end of the day, sit down and think about what you’ve done. Write it all down, all of it. Include anything that involved moving yourself or objects, creating something, communicating with people in any way, having deep thoughts, having shallow thoughts, exercising, stretching, taking your meds, taking your vitamins, and any form of resting and recharging, even watching TV or playing computer games. Everything counts. Write it down with a little box in front of each item. 3) Take your pen proudly in hand, and go down the list, confidently checking each item without pausing to consider if it has been done. If it’s on the list, it has been done. It’s a to-done list. That’s all! You did it! Great job! 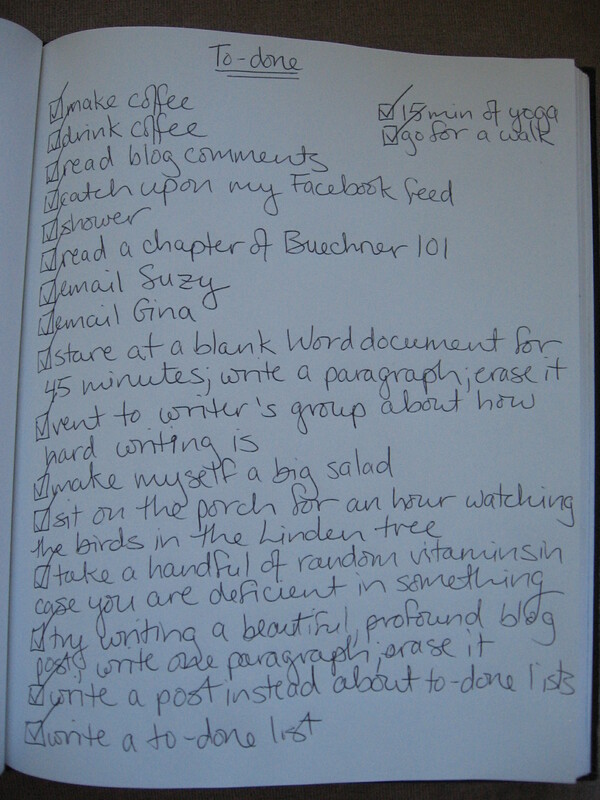 You can read my original post, How to write a to-do list, here.